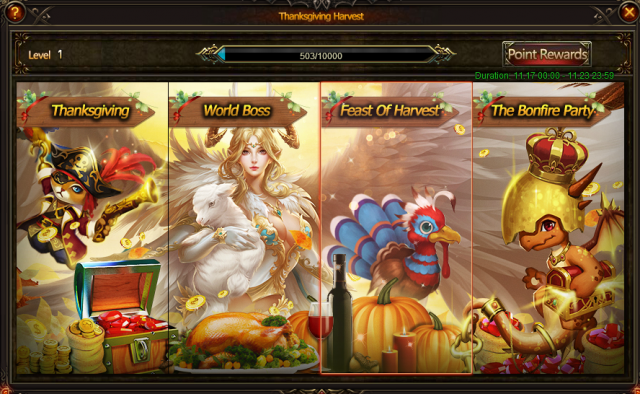 Welcome to Thanksgiving Party in League of Angels! Thanksgiving Party kicks off at 0:00:00AM on Nov.17th(server time)! Come join the fun in League of Angels now! Let's see what's new here! Description: Happy Thanksgiving! 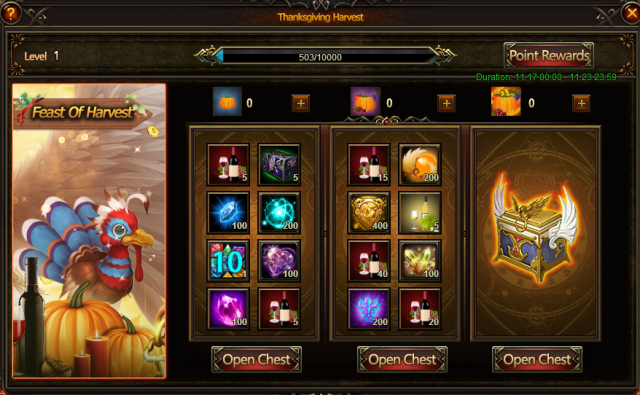 Use your Thanksgiving keys to open chests and exchange tokens for amazing items! 1. Elianna, Aurora, Apocalypse(and her awakening stone) and Zveda are waiting. 2. Choose powerful heroes and equip them with amulets! Cedric, Dragon Commonder, Dragon Ruler, Supreme Oracle, amulets of the Zeus series will all be available. 3. Dress up Popstar Fashion and take Moonlight Hare with you. 1.You can exchange your Starfish for Thanksgiving keys on the FIRST AND SECOND day of the carnival(11/17 &11/18)! 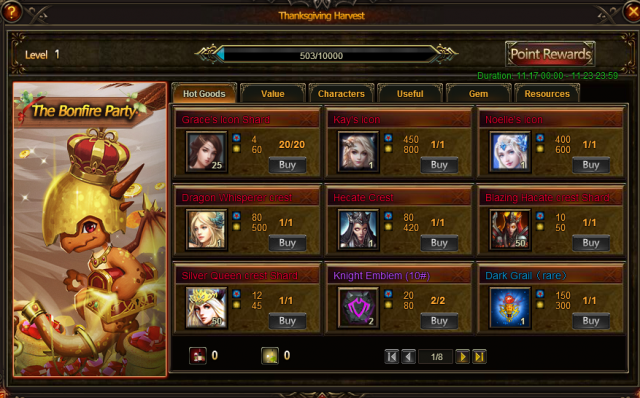 4.Check out Thanksgiving Feedback from Nov. 19th to Nov.23th in Hot Events! Friendly reminder: Time is limited! 2.Opening chests in Feast of Harvest. Description: Time is limited! During Thanksgiving Feedback, you can gain different Thxgiving Keys in certain time periodby consuming resources and diamonds. Note: The frst wave starts at 8PM Nov.19th (server time). 1. The Adv. Khaos Equip(Boots) Chest is available now! Hurry up if you want to increase your battle rating. 2. Take Supreme Valkyrie and Divine Angel with you now. You always need a powerful hero. 3.You will be able to get a lot of Golden Dragonsoul Packs,skill books, fusion gems and resources there! Friendly reminder: Capsule Toys will bring a NEW ANGEL MAIA and Treasure Hunt will be back after the version update on Nov.17th! Stay tuned! More exciting events are coming up through November 17 to November 23 (server time), check them out in the in-game Hot Events now!